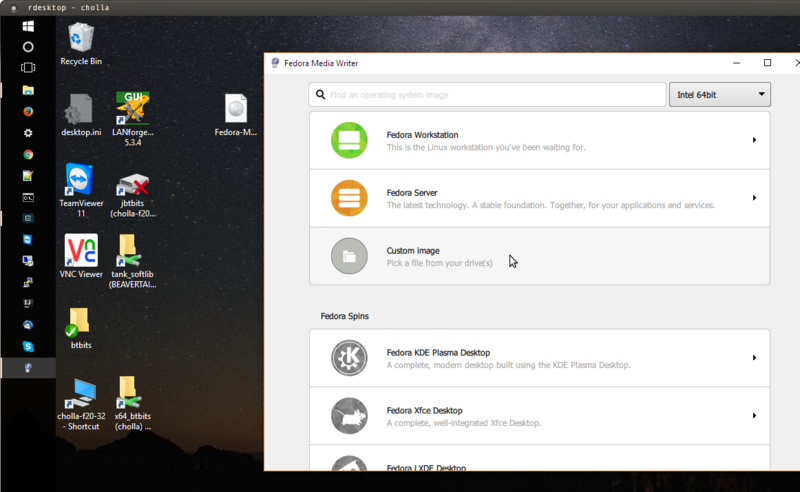 Installing Fedora is the first step to building a LANforge machine. You might be doing this when you are installing to new hardware, doing an OS update, or replacing a failed hard drive. LANforge should work on most releases of Fedora, but please ask your support contact for a suggested version. LANforge 5.3.7 on Fedora 27 was the most recent combination as of this writing. PC/Server computer with 4GB+ RAM and 16GB+ SSD/Hard drive. If you are replacing the hard drive, do the hard-drive replacement before you start these instructions. On a CT52x chassis, you can open the bottom of the case by turning the unit over and unscrewing the rubber feet. 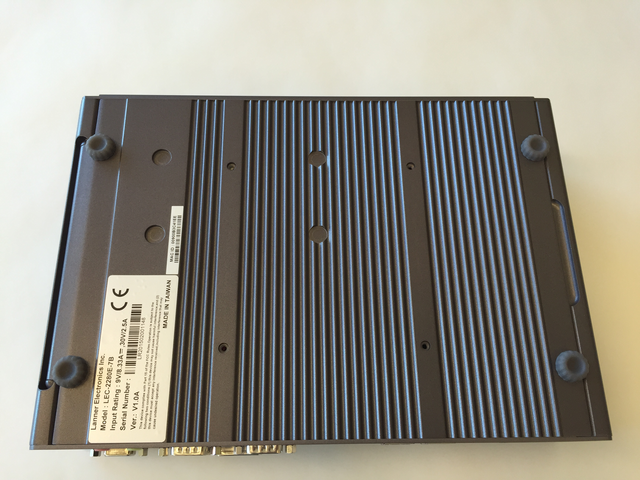 When you open this back panel of the chassis, you will see a SSD attached to the inside of the bottom panel. 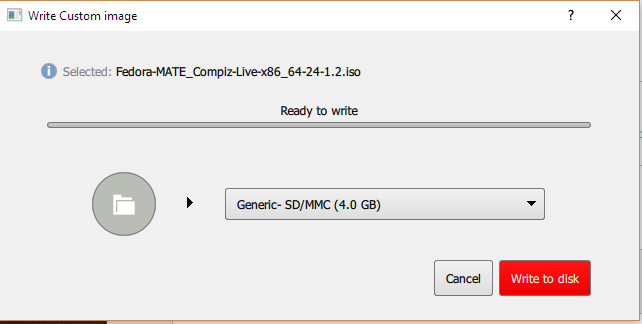 Begin by downloading a Fedora MATE install CD image. The Fedora project describes making these CD images on their website. We suggest looking at their installation guide as well. 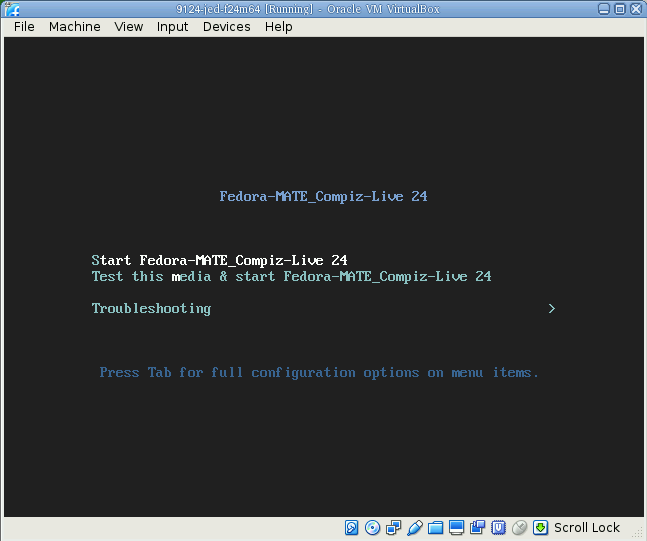 Fedora comes in a stock workstation image and many spins. Our instructions assume using the MATE spin. 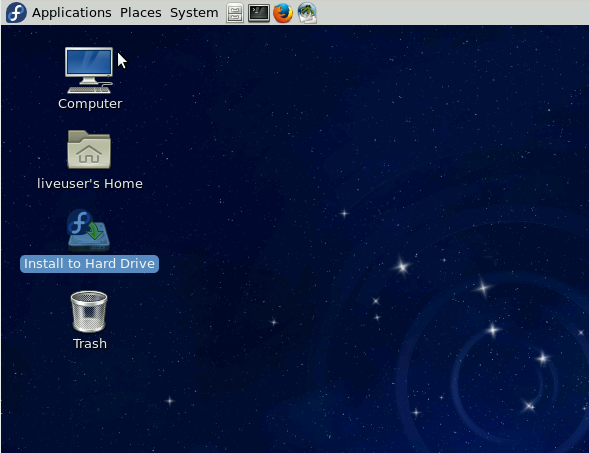 MATE is a lower resource desktop with a more familiar look and feel to older Fedora and Windows users. 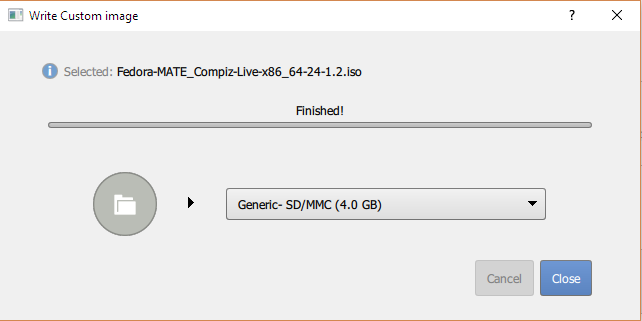 You will want to download the F27 ISO image. Once you download your image, we suggest you verify the SHA256 hash. There are a number of utilities you can use to write ISO files to USB sticks, but here are two recommened methods: 1) the Fedora Media Writer, and 2) Rufus. 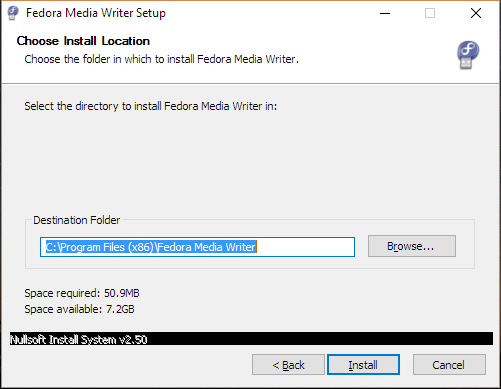 The Fedora project provides the Fedora Media Writer as their default Windows-oriented download. It is simple to use, and you can use it to write any ISO file you downloaded earlier. The following series of screenshots shows using it. There is also further USB creation information at the Fedora Wiki. Once you have written your ISO file, you should verify the SHA256 hash. 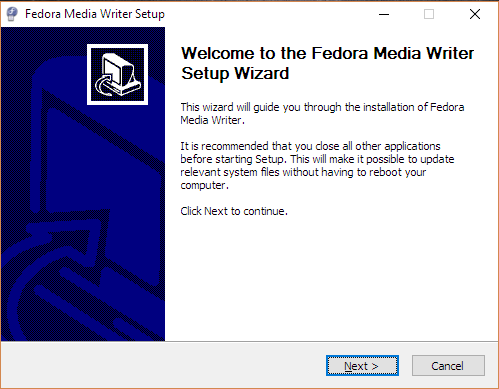 Start at The Fedora download page and by clicking on the big green button, you download the Fedora Media Writer. Rufus is a Win32 USB writing utility. If you collect good Windows utilities, you might want to use this. 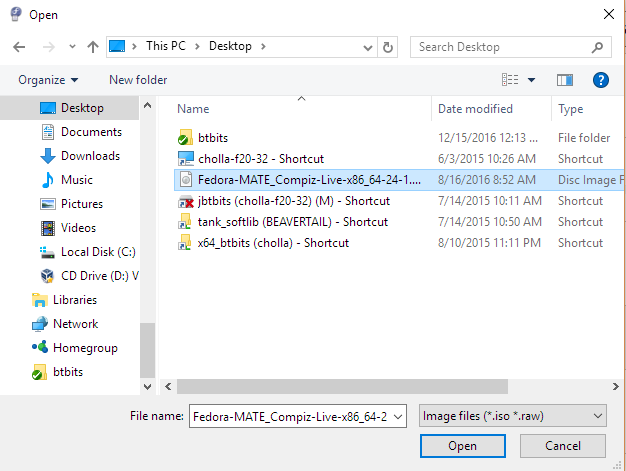 Using Rufus is described in this LifeHacker article. Or you might use the command lsblk which will list all your drives. You can use the dd utility on the command line. That might take a few minutes to write. 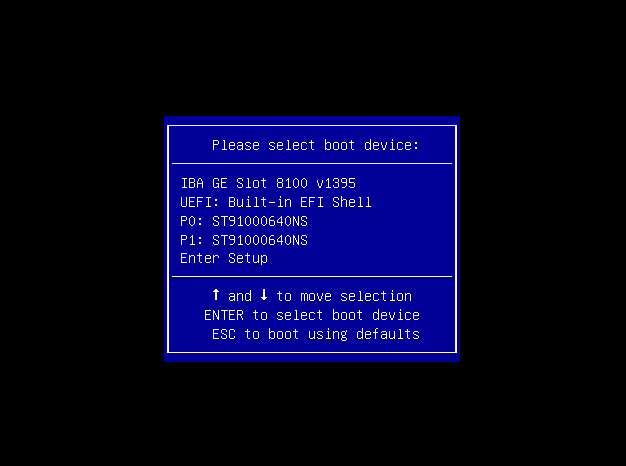 There are two ways to get to the BIOS boot menu. Place the USB stick in the intended LANforge machine, power it on and press the Delete key Del while it boots up to get into the BIOS. 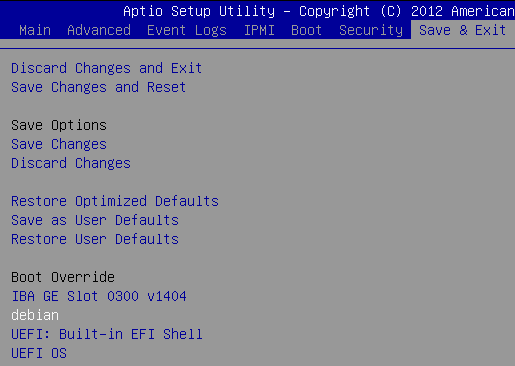 Go to the EXIT menu and select that USB drive as a boot over-ride. Root password: lanforge. 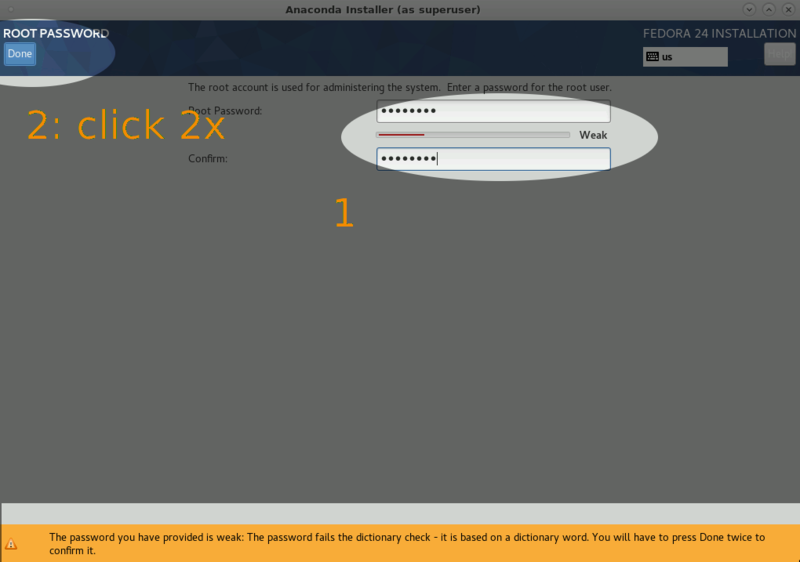 You can change the root password if necessary, but this is the root password that matches our documentation. User, lanforge, password lanforge. You can change this password if necessary, but this is the password that matches our documentation. 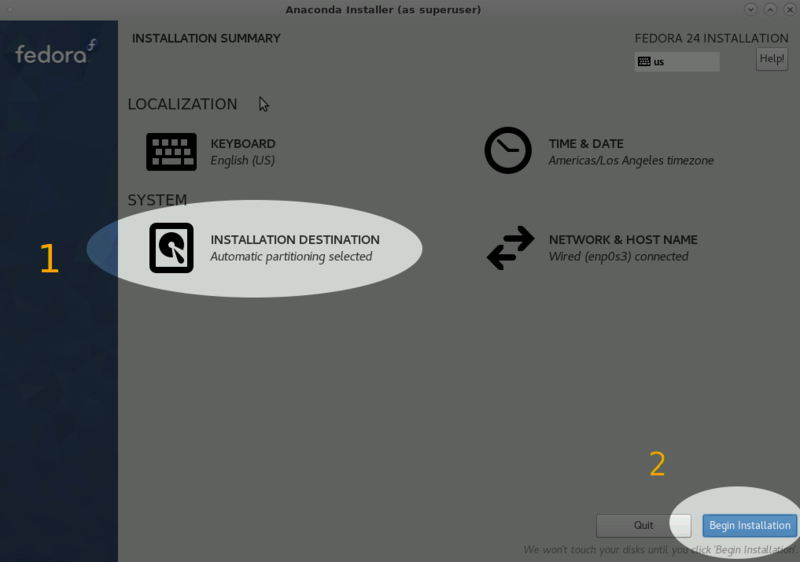 Select Installation Destination; then click Begin Installation. Once the installation completes, reboot the system as it suggests and while the system is rebooting, remove the USB stick. 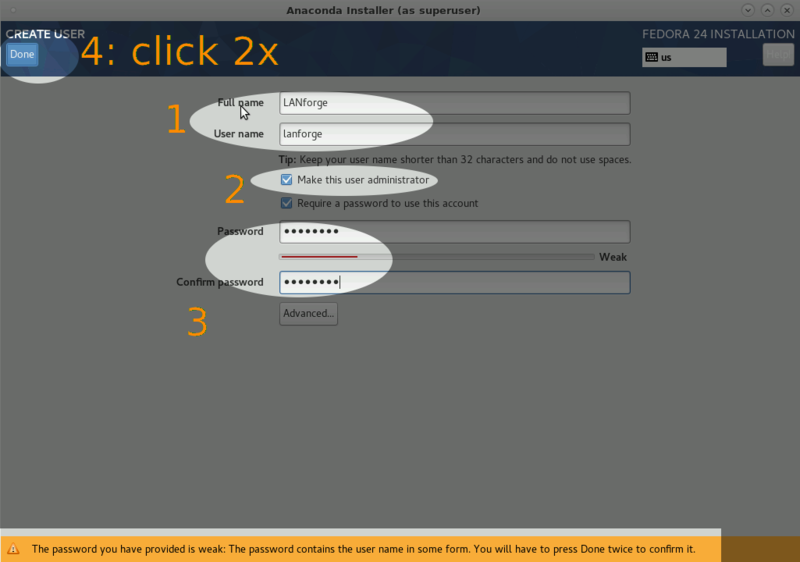 Make sure you can login as user lanforge and that you can open a terminal and use the command sudo -s to become root. While in that terminal, do a sudo dnf update. This will speed up the installation of LANforge in the next step. After doing those upgrades, reboot the system again. LANforge systems shipped by Candela often have additional configuration changes, such as renaming network devices and WiFi radios. Please contact support to help with redoing these changes as needed. Often, this is 'nice-to-have', and not 'required'. You can now proceed to our normal LANforge installation instructions.